Sthol-padma or Confederate rose (hibiscus mutabilis, family: malvaceae) is a wonderful Perennial hibiscus that comes from China. The deciduous plant is introduced to Bangladesh as well as Indian sub-continent and USA. This fast growing woody shrub can grow up to 3 meter tall. Common Name: Sthol-padma, Sthalkamal, Confederate rose, Dixie rosemallow, Cotton rosemallow. Leaves are simple, alternate, deeply cordate, 3-5 lobed, 8-15 cm long, hairy on both surfaces, petiole long. The flowers of hibiscus mutabilis are large or small, double or single, 9-18cm in across. white, red or pink. It is called 'changeable rose' as it changes color with the change of time. Flower blooms in September-December. Propagation is caused by cutting and air layering. Leaves and flowers of hibiscus mutabilis are are used in piles, abortion and urinary problems. Extract of root is used in menstrual problem. Kaakmachi or Black nightshade (solanum nigrum, family: solanaceae) is a perennial herb with soft stem and many branches. It is native to Eurasia and introduced to the tropical and sub-tropical regions of the world. Common names: Black nightshade, Garden nightshade. Fruit is a berry, smooth, 5-7 cm in diametre; green and bitter when raw and black or purplish black. In Bangladesh and Indian subcontinent another variety is found with berries that turn yellowish red when ripe. Ripe berries are attractive but poisonous. The flowers are small, pure white, clustered. Solanum nigrum is used in ulcer, piles, fever, vomiting, swelling, urinery and liver diseases. Ashoth, Ashwatha or Bodhi tree (ficus religiosa, family: moraceae) is a gigantic and very aggressive tree. This deciduous tree holds well-spread crown & has irregularly shaped trunk. The tree is originally found in Bangladesh, India, Nepal, Sri Lanka, Thailand. It is introduced to Israel and USA. Common names: Bodhi tree, Pippala, Peepal, Ashwattha. In Ramna Park (Dhaka) a centennial Oshoth tree is the center of attraction of the festival of Pohela Boishakh (Bangla new year) arranged by Chhayanaut. During the festival of Pohela Boishakh. Deciduous ficus religiosa gives reddish new foliage in the spring (March). Fruits are fig, develop in pair on leaf axil, sessile, sub-globose, depressed & pink when ripe. Small unisexual flowers remain inside fig. It can grow everywhere in Bangladesh. It can be found on roof or window-shade of a building, in waterside area, on roadside or a huge trunk or stem of a tree. New leaves are gorgeous, reddish in color. 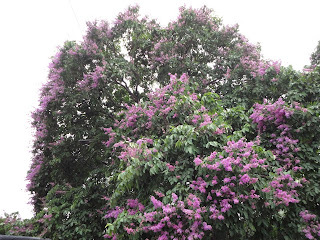 Jilapi Babul or Blackbeed tree (pithecellobium dulce, family: leguminosae) is a medium-sized evergreen tree with pofused branches and spreading crown. The tree can reach a height of 10-15 m. Trunk is spiny. Bark is grey. The tree is native to Americas. It is introduced to South and Southeast Asia. Common names: Khoia babla, Jilapi babul, Jilapi, Dokkhini babul, Blackbeed tree, Manila tamarind. Leaves are bipinnate, each pinna has a single pair of ovate-oblong leaflets. Young leaves are brownish. In Bangladesh flower blooms in spring, They are small, fragrant, greenish-white, 1 cm in diameter, borne in globose head. The edible fruit is a pod, 10-15 cm long. When ripe (in summer) it turns tightly-coiled shape and reddish-brown in color and this is the main characteristic of the tree. Fruit tastes sweet and sour. Seeds are shiny, black in color. Leaves and raw fruits are used as cattle fodder. Bark is used in fever. Bhat, Hill glory bower (clerodendrum viscosum, family: verbenaceae) is an annual shrub attaining a height of 2-4 metre. It is found in the tropical and sub-tropical regions of the world particularly in Bangladesh & India. Hill Glory Bower flowers are white, scented, borne on terminal panicle. It is a flower of spring. Leaves are dark green, petioled, ovate-lanceolate, 5-10 cm long & 2.5 -7 cm. wide, alternate. Sepals 5, light green, petals 5. Lower parts of petals are brushed with red color. Stamens are much longer than petals. Common names: Bhat, Ghetu, Bhatphul, Hill glory bower. It grows on fallow land as weed everywhere in Bangladesh. The plant is used in malaria, chronic fever, skin disease, pain, insect bite. In worm & louse infection it is also used. Fruit is a drupe, purplish blue, 1.5-2.5 cm in diameter. Lutki or Malabar melastome (melastoma malabathricum, family: melastomataceae) is a perennial shrub found in tropical and sub-tropical Asia. It is a common plant of Shal-forest and the hilly areas of Bangladesh. The evergreen shrub is found throughout South and Southeast Asia. Common names: Lutki, Datranga, Tea indicator plant, Malabar melastome, Indian rhododendron. This shrub can reach a height of 1-2 meter high. The quadrangular and reddish stems are covered with small rough hair. The leaves are ovate,-elliptic, or elliptic-lanceolate, 7-20 cm long with three ribs, hairy. The petiole 1-2 cm long. The nice looking shrub flowers throughout the year. Flowers are big, showy, purple in color, grows on terminal inflorescences. Petals 5, sepals 5, stamens 10. The edible fruit is a berry; globose, 5-13 mm long and 4-10 mm wide, succulent.